What would you do to save the world, or possibly destroy it all? M. Night Shyamalan's Glass film takes this question to the extreme. Whether you're on the side of David Dunn, the Beast, or Mr. Glass, it's very likely that heroes live among us, but how we let the world know of their existence—and whether their existence will save or destroy the world—is entirely up to you. For this contest, you're invited to create an entirely new character in the Glass story arc. Be inspired by events in the film, as well as whatever your imagination may have in mind. Whether they're a hero or a villain, don't forget to give your character a convincing backstory that makes their journey even more interesting. Two (2) First Place and six (6) Second Place winners will be chosen by M. Night Shyamalan himself. Winning entries will then take part in a community battle, pitting heroes against villains on DeviantArt to determine who will reign supreme. Watch the trailer and download the assets from the film to learn more about Glass. Create an original hero or villain character within the world of Glass. Include a brief description of the hero or villain backstory explaining the original character. Submit your artwork to the contest using the button below. The Glass Heroes vs. Villains Contest begins at 12:00:00 PM (PT - Los Angeles Time) on March 19, 2019 and ends at 11:59:59 PM (PT - Los Angeles Time) on April 8, 2019 (The "Promotion Period"). Entrant must be at least thirteen (13) years old as of March 19, 2019 to be eligible to enter the Contest. Entrant must submit a completed entry of an original artwork that illustrates an original character as a hero or villain within the world of the Glass movie. ARV of all prizing is $13,090.00 USD. Please read the Official Rules for more details about judging. Enter the Glass Heroes vs. Villains Contest, judged by M. Night Shyamalan, for your chance to win $3,000 and more! Perhaps it's the dark wavy hair and the brown eyes, but if you think there's a similarity, it wasn't my intention at all! I had a very specific idea for the face in mind, but the character ended up slightly Mediterranean-looking in the end (which I do not complaint about, actually). The eyes were also supposed to be hazel green, but I eventually changed them to brown because I felt a darker color would stand out more. I just feel like these pictures fit the actual rules better and were way more realistic in the powers and abilities. Thank you! I am honored that you feel this way. I must admit when I saw this in my notes my heart skipped a beat xD I thought I had won haha. When I made the character I spent a lot of time on the idea and design and didn't have a lot of time for the illustration part. It was a real challenge for me to design something that in my idea would fit the glass universe since it's so subtle like you say. I guess I was mistaken, and should have let my imagination run a bit more free and spend more time on the execution. But it's a lesson for next time I guess I am happy for the winners. I'm so sorry to get your hopes up high, I know how that feels! But I truly did think yours should have won, it matched all of the contest rules way more than the actual winner. I think that's the problem here, if he just wanted to see good art entries, then he should have said that. It's not right to stifle the talent of some artists trying to stick to the rules by making their hero/villain fit into a realistic fashion, while rewarding others who threw those rules out the window. Also if i'm being honest, your art style was just as good if not better then the actual villains winner art style to me. I almost wonder if the one who did win, won because he made his male character look like Mr. Shyamalan XD When in doubt stroke the ego of the judge, because if you read what he thought about most of the winners it always some how leads back to him and some idea he had a long time ago. Anyway congrats on making an awesome piece! I find this quite insulting to my intelligence. All pieces are amazing works of art done by great artists for sure but shyamalan you need to be clearer in writing out your judging criteria. Don't create briefs for others to follow only to go off it yourself. Your previous contests placed more emphasis on 'visual impact of the art work' but to me this one seemingly placed more emphasis on "quality of the brief back story in the world of glass". Someone correct me if I'm wrong. What does quality mean to a successful writer such as yourself? The brief as led many to work harder on the back story of their characters to fit in the world of glass. You have surprisingly chosen a few works that don't have any association with your movie. You also said something about the characters being more realistic or subtle..but im sorry there is nothing realistic about the beast climbing up walls and and hanging upside down with no assisting attachments..that is supernatural. Also how is seeing people's secret crimes by just touching them realistic? This makes me question the credibility of this contest, which is attached to your name. I had high expectations of this contest but to my disappointment it lacks consistency and professionalism. If the visual impact of the work was conveyed as the key criteria of selection in the brief of this contest I believe so much more contestants would have taken part and just painted art pieces that would have blown us all away. Also it was stated their will be a community battle on Deviantart...and how are these characters you chose supposed to 'battle' one another with the nature of their abilities? Or is it just a vote 'hero' or 'villian' thing? What does character design mean to you? Clearly I must have missed something and let my imagination go beyond the scope of this contest. This is not to undermine any contestant or to contest their success( as your decision is final anyway) but to call it out for what this competition really is. Due diligence was not applied in this contest and only one criteria out of all four was considered just because it makes your job much easier. This to me is surely lack of integrity in this competition. So people don't bother reading shyamalan judging criteria on any of his contests..just paint. He's a very busy man and that's all he is got time for. This is by no means to justify his somewhat shady side account but you must remember this is foremost an art contest not a writing contest. When I was reading about this contest a while back I had no impression that the backstory of the character was the most important factor for this contest. The trailer was linked in the first place as more so an inspiration of what the contest artwork should be based on. What I gathered when I saw the trailer was that the "power" were more low-key. In the sense that they don't have fire coming out of their bodies, can fly or shoot lightning out of their hands. All the powers in the trailer and their depiction on wiki were focused on super human strength and some paranormal abilities. In a sense as long as the character isn't magically invisible or doing anything too magical then you can almost create any character you want and it would be somewhat realistic. Just imagine someone goes up to you and says " I can shoot fire out of my body" versus someone who says "I can see your future by touching you". Both are not really realistic but I'm more so inclined to believe the latter. "Quality of the brief back story in the world of glass". Brief is more so another way to say a short summary. Quality = good. Simply a good short story explaining the character and how it relates to the illustration. Mostly, does the illustration convey much of what the summary says. If so then you are good. Since this is an art contest, the judge is more inclined to look at the art first then narrow the entries down. After narrowing the entries down, they read the back story. Then both the back story and the art goes into consideration of the final judging. That's how I would assume most judging of anything goes in an art based contest. Remember although backstory was listed as the second bullet point, it doesn't mean it's the second most important. The judging was based on can he see this character in his story-line? Does the the back story match the illustration? Hence "as depicted in the Work". Does it portray the theme? Basically hero or villain and what kind of power. Lastly, Originality and artistic skill. All these were criteria. Thus all must be present. Remember most contests don't require to create a new character so most never mention back story. The only major difference compared to the other contests in terms of criteria, is instead of "action and settings" it became back story. In a sense its the same sh*t. Actions and setting are used for mostly fan art contests because the backstory of the characters already exist. So that criteria focuses on the story of the illustration. If you know the character, it's quite easy to understand the story the illustration is telling. He wouldn't know jack sh*t about the characters that the contestants create. That back story criteria is there to support the illustration. That's why I didn't consider it as the most important. The fact of the matter is that there are a lot of grey areas in the contest, which shouldn't be as it came across as professional. That is not what you expect when a well known Director and the largest Art platform collaborate in hosting a competition. The importance of 'back story' in the competition because of its position in the criteria might be an assumption but this is why rule or criteria writers use terms such as 'in order of importance' and 'in no particular order' to eliminate confusion. That should have been clear. You said his characters possess some paranomal abilities..to me that equals supernatural. To predict the future is logically impossible as this involves experiencing physical events that have not yet materialized in a physical state, events that are entirely based on occurences in the present physical state. In short, the future doesn't exist and the past is no more. But supernaturally this might be possible. Shooting fire might not be possible but at least fire eaters and spitters don't need to be supernatural. I go with fire shooters on that one (lol). They stated 'brief' in the rules. How brief is brief? Two lines? Five? A page? Once again it should have been clear. There is a difference between 'character profile/description' and 'character back story'. In character description you just outlay the powers and profile. In a back story we need to know why, how and possibly when the character came to be the way they are, in this case a Hero or Villain. How they came about discovering their abilities should be explained too. Even visually speaking, some of the entries are either too spiritual or gruesome going by their own criteria. The most important aspect of the criteria I believe was over looked is the 'in the world of glass' part. To me as an artist and a writer, this means to write and create your character into or around the story, events or characters in the glass movie. To what degree is another matter but it needs to clearly portrayed in the brief. I can't perceive any other interpretation of this statement. Yes the account is shady. You don't need a Deviantart account to veiw and Judge entries. To fave winning entries before the results are announced is quite unethical which begs the question of who really chose these entries? Well...I honestly didn't have hopes here because there were better entries than mine from the very beginning. Just wanted to clear that out. I apologize for using your comments here..but let's face it..we are all human and that kind of move will stir excitement in any artist even if it is for just a moment. Why do you sell yourself short? If you can't stand up for yourself and your work do you think anyone else will? I have seen your work..its is amazing stuff so after all these questionable situations I hope you still don't believe you didn't deserve a winning spot. All of us are different, some people need to show themselves as super confident guys, others are more quiet about themselves. I don't need to brag around or self-validate me in public. That's a waste of energy for me. I honestly think that there were better entries, I've learned to appreciate other peoples art and know where are their strong points over mine and what could be more appealing to certain judges over my own work. That certainly doesn't make me less human than everybody else, just different. I truly appreciate your kind words about my work, I'm a professional too, but I know when to step back. This is not the end of the world and certainly not my last entry to a contest . I just keep moving, that's my thing. Nicely said and you don't have to say anything about other people's art. This is not an issue of what work is better than what work. This is about what work ticked all boxes. Not everyone is able or interested in voicing their opinions. We as contestants were bound by rules in this contest and so are the judges. It is an owed duty that they follow the contest brief which was set by them. I only speak for myself and those who feel the same way. I can't just keep quiet seeing this. It won't change anything but I feel much better for it letting it out. Its not my first or last contest, but it surely is my last Deviantart and shyamalan combo contest. No problem. Thank you kindly. DR Twist did it again XD everybody thought he would like the best stories and character desing,but the twist is he only liked those that reminded him of ideas he has had in the past and those that where done in a similar way he would ,I feel shame for the artists that really put their souls in their characters and made great original stories and character designs ,to me those few are the real winners!!!! Can't wait for the announcement. Here's mine. Born in Langhorne (Close to Philadelphia) to a middle class family. He was a savant and could solve most problems and puzzles. He studied criminology because he believe it would be a great way to use his abilities for good. Gabriel met his wife in college and since then has one daughter. 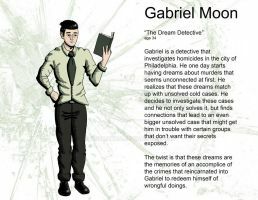 He works as a detective that investigates homicides in the city of Philadelphia. He one day starts having dreams about murders that seems unconnected at first. He realizes that these dreams match up with unsolved cold cases. He decides to investigate these cases and solves them one by one. Not only does he solve them, but finds connections that lead to an even bigger unsolved case that might get him in trouble with certain groups that don’t want their secrets exposed once he puts the pieces together. The twist is that these dreams are the memories of an accomplice of the crimes that reincarnated into Gabriel to redeem himself of wrongful doings. High pitch sounds - This stems from various events in which school bullies would torture him with nails on the chalkboard and scraping plates with utensils. Congrats to all the winners, all amazing pieces. Good luck to everyone who's taken part! Any idea when the winners will be announced? curious to see who makes it through. Good luck to all entries! I too would like some critique on both my art and the story that goes with it. Can't wait to hear the results! Here is my entry, would love to see feedback from this comment thread, good luck to all involved! Best of luck to those who have entered! I’m really enjoying going through and reading all of your ideas and the artwork accompanying them! Here’s my entry for the contest! I’d love to get some feedback on the image or the story itself so I can grow in future projects! Thanks a bunch! Here is my entry. Good Luck to all the Villains and Heroes! This is my entry. I know I don't stand a chance at winning because there are just so many masterpieces in this contest but I'm still happy with how mine turned out. Where I can see the list of winners? I am extremely excited! I don't think I will win and that it okay! But to see the new editions to the story is wow mind blowing. And that they are created by fellow deviants is amazing. Congratulations to those who win! Are 8 winners being found out ? Have they announced winners yet? Love your character btw.. Thanks for the update. Atomic Blonde Fan Art Contest Celebrate the home release of Atomic Blonde with a new contest from DeviantArt! Create an original piece of art illustrating secret agent Lorraine Broughton (played by Charlize Theron) in the world of Atomic Blonde — inspired by the movie and exclusive animated storyboards. The We Happy Few Wellington Wells Postcard Contest Dive into the world of Compulsion Games' We Happy Few and enter the Wellington Wells Postcard Contest for your chance to win $3,000 and more! Behold the happy town of Wellington Wells! It's bright, shiny, and the people are so friendly! Everything is wonderful in Wellington Wells...right? The Pacific Rim Uprising Global Jaeger Contest Enter the Pacific Rim Uprising Hometown Jaeger contest and you could win $6,000, a signed movie poster, and more! The CONTEST starts today and end 19th September 2019. He is a raven sidhe, a trickster fairy and overall an awful person to deal with, if you are human. Arlen Fram, a young evil mage, possessed by the evil demon. Draw My OCs Contest $300+ PrizesI'm holding this contest because I really need more art of my characters. I have a hard time tracking down people to commission and I love surprise art of my characters. So this solves two things for me. First prize: $50 (USD) or a 2 characters illustration. Second prize: $20 (USD) or a 1 character illustration. Third prize: $10 (USD) or a 1 half body character illustration. Fourth prize: 200 Deviantart points. Fifth prize: 200 Deviantart points. !!Contest!! +Update!! ($100 + art in prizes)Hello everyone! Now is your turn to bake your way to success and gain the Golden Chef Hat and be the envy of your friends! Just like in the original Nailed It! Show, you'll have the opportunity to choose the cake you'll have to recreate, for that go to this poll and vote for your favorite cake, the winning cake will be the cake you'll have to re-make! Voting closes Wednesday, April 3rd.